Fantastic indoor outdoor flow between the lounge and the courtyard. Relax in the sun in the north facing courtyard. Lay back on the luxurious leather couch. Seating for 4 around the dining table. Modern kitchen with gas stove. Enjoy a delicious coffee from the Nespresso machine. Relax on the very comfortable bed. Plenty of storage in the bedroom. Bosch washing machine and dryer. This 2-storey townhouse is located in a quaint suburban street in beautiful Freemans Bay, next to a reserve. The downstairs open plan living area opens out onto a sunny, private courtyard, with the bedroom and bathroom tucked away upstairs. A car park is located just outside the door. You’ll also benefit from a small group of shops nearby, including the best Japanese restaurant in the neighbourhood. Victoria Park and a supermarket are less than 10 minutes away. The location is simply outstanding. 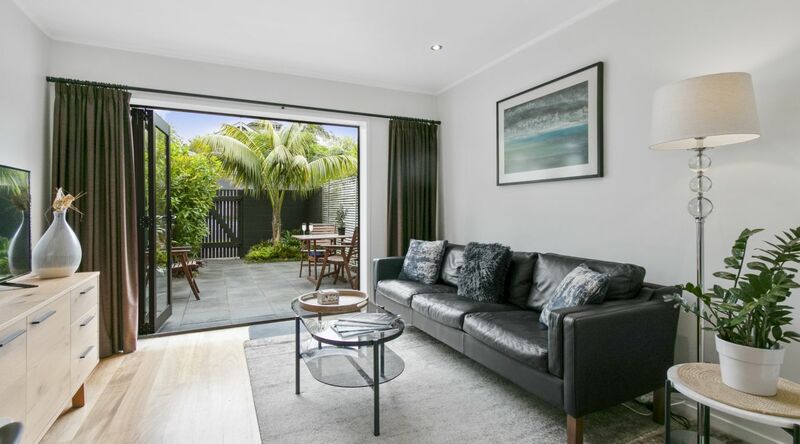 Freemans Bay is the best city fringe suburb there is and our townhouse is perfectly positioned between Ponsonby Road with all its cafes, shops and great eateries and Victoria Park and Wynyard Quarter beyond. Little more than a stone's throw away from the hustle and the bustle of the city, yet tucked away in a quiet side street, we are isolated from the noise of the central city, yet only 400m to Ponsonby Rd or a 15-20 minute walk from Wynyard Quarter and much of the CBD. This 2-storey townhouse has a sunny, private courtyard - the perfect spot for a morning coffee, a meal or a sundowner. An abundance of natural light through the north-facing floor-to-ceiling bi-fold doors make this a light and airy, spacious townhouse, with plenty of room to spread out, both upstairs and down. The townhouse has been recently renovated and furnished to a very high standard with new modern contemporary furniture, one of the most comfortable beds you’ll find anywhere and original artwork from a local artist. The townhouse is in a residential area and close-knit community, so no parties are permitted in the townhouse at all times during your stay. This applies to all residents, so ensures you will have a peaceful and quiet stay yourself. The townhouse is located in a central city neighbourhood, so you will be surrounded by other townhouses and other residents. That’s not a downside, since the neighbours are generally a very considerate group of people, but you will be aware of their presence on occasion. Most people actually love it, since you will have a chance to meet locals and quickly strike up a conversation. Live like a local amongst locals and you will love your stay. Living in a close-knit community requires some basic rules to make things easier. We ask that you abide by these rules and that you are a considerate neighbour. By all means, live and enjoy yourself, just be mindful please of noise and loud music both inside and out and you’ll have a fabulous time. We have furnished this townhouse to make it the home-away-from-home you will no doubt appreciate. Our fully equipped kitchen includes chef-quality stainless steel gourmet cookware and good quality knives. We’ve supplied a Nespresso machine and milk frother for coffee aficionados, and a classic teapot so you can brew the perfect cup of tea. Sit back and relax in style on the comfortable sofa while watching Netflix on the 40" Full HD Smart TV or listening to some music on Bluetooth UE BOOM speaker. The bedroom features a queen size bed, which comes with wool all-seasons duvets, high thread count sheets and a selection of soft, medium, hard and feather pillows. The large closet is stocked with clothes hangers. The laundry has large Bosch front-loading washer and heatpump dryer, and we supply EcoStore washing powder. From the townhouse it is only short 400m walk to Ponsonby Road and about 20-odd minutes to Wynyard Quarter. Alternatively, a $5-10 Uber ride will take you pretty much anywhere in the central city, including Westhaven, Wynyard Quarter, Viaduct Harbour, Queen St, and Ponsonby. A single off street car park is located behind the property. Please note that the carpark is only 3.7m long x 2.2m wide, so won't suit large vehicles longer than about 4m. Street parking is unrestricted between the hours of 6pm and 8am weekdays and all day weekend. Parking is restricted to two hours between 8am and 6pm on weekdays. 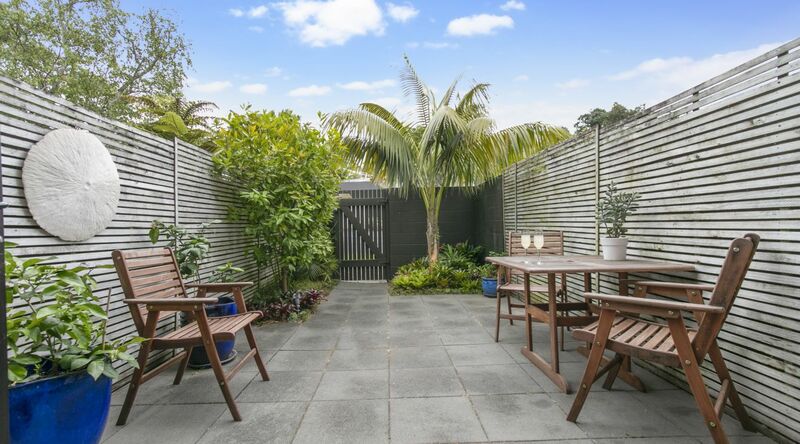 The townhouse comes with 1 carpark behind the property and is otherwise fully self-contained. We have been local residents for nearly 15 years now, so are on hand should you need assistance, whatever it might be. Otherwise, we're quite happy to leave you be. Simply relax and enjoy your stay. Whether you are travelling for pleasure or business, fly solo or with a partner, this townhouse will take care of any demands you might have. This is the ideal city pad to use as a base to explore Auckland and the islands of the Hauraki Gulf. If you are travelling on business, you will have the CBD at your doorstep and easy access to the motorway system, yet in an environment which is much more welcoming, relaxing and personal than any hotel will ever be. We've also created a comprehensive online guidebook of local attractions that we will send you a link to after you book.